The 9mm handgun is easily one of the most common calibers purchased worldwide. So we went looking for the absolute Best 9mm Cleaning Kits we could get our hands on. Our team poled numerous gun clubs and shooting ranges to find out exactly what shooters search for in a gun cleaning kit. Shooters look at the versatility of the kit, the quality of the cleaning rod and brushes, the included attachments, and design of the storage case. Therefore, with those criteria in mind, we found the Best 9mm Cleaning Kits and our team spent an extensive amount of time reviewing them. We want to make sure that we save you time in searching for your next 9mm gun cleaning kit with our detailed review. Hoppe’s is known for their reputation for making some of the best solvents and gun cleaning products. Along with those products comes their line of gun cleaning kits, and their 9mm kit has the essentials. Thanks to Hoppe’s and their production team for putting together a simple yet comprehensive little 9mm gun cleaning kit. Many cleaning kits on the market offer either the cleaning products or the equipment to clean your gun. However, with this kit it comes with the best of both worlds, cleaning supplies and tools. 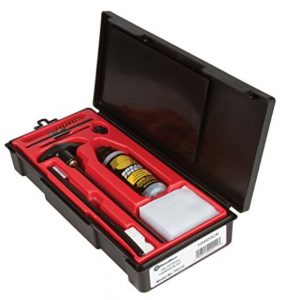 The kit offers their solvent and lubrication oil. Giving you the essentials for cleaning your pistol. As for the tools included, Hoppe’s offers their Aluminum cleaning rod that is used as the main tool to clean, oil and lubricate your barrel. The rod is a common solid aluminum design where one side is threaded allowing for the three universal attachments to connect. Whereas the other side of the rod is a solid set handle, giving you something to grab on to as you clean your barrel. Since Hoppe’s offers such a nice kit I’ve used this one as my travel kit, everything that comes with the kit fits in their storage box. Therefore, preventing me from forgetting my solvents or cleaning tools. 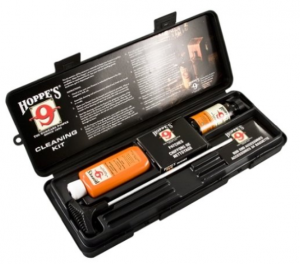 This makes the Hoppe’s gun cleaning kit a perfect kit to bring to the range. The Hoppe’s 9mm kit is one of our favorites because of it’s simplistic approach. However, it doesn’t offer the quality we would prefer. It still makes the list but doesn’t take the gold. Real Avid manufactures an extensive variety of products. At Guns Cleaner we have used everything from their boresnakes to their cleaning mats. Real Avid creates some of the highest quality products we have ever used. They spend a lot of time manufacturing their products with high-quality materials. They also ensure their products have multiple uses, making them a great value. 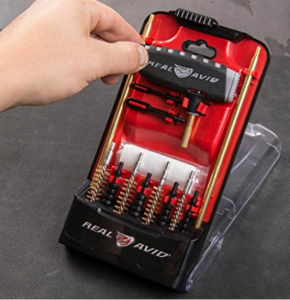 Real Avid created one of the best 9mm Cleaning Kits. The kit is one of the most universal kits on the market today. Not only is their kit meant to clean 9mm pistols, but also .22, .357, .38, .40, .44 and .45 caliber pistols. To top it off all of the tools fit in a small soft carrying case. The case is a nylon weatherproof zippered shell with internal trays keeping everything organized and compact. This is a great case to bring to the range, especially if you are shooting multiple caliber handguns. It fit’s in the palm of your hands so it doesn’t take up much space. You can pretty much carry it in your pocket. Included in the gun cleaning kit are phosphor bronze bore brushes and red nylon jags. The kit is universal allowing you to clean all types of makes and models. We really enjoyed using this cleaning kit for our 9mm. We found that the cleaning rod and brushes never lost their strength after extensive usage. The Nylon Jags worked really well to help push cleaning patches inside the gun barrel. They were really durable and a nice way to clean the barrel alongside the typical nylon slotted tips. Real Avid Gun boss is our favorite 9mm cleaning kit. It fits the criteria of what shooters are looking for: versatility, quality all with a great value. Handgun owners need to have this kit as your first pistol cleaning kit because you more than likely will never need to buy another pistol kit. Otis is well known for manufacturing and assembling the finest American made products. All of their products come with a limited lifetime guarantee with each purchase. Otis stands by their products ensuring they are offering products that their customer want. Therefore, they have products for pistol, rifle, and shotgun owners. They have even been able to create some of their own trademarked products. Which include their cleaning system and cleaning rod. Otis’ cleaning rod is very unique. Instead of offering the conventional solid aluminum rod. They offer a Memory-Flex© rod which are flexible cables that are coated to make sure they don’t rust or scratch your barrel. The rods have brass ends that the bore brush and nylon patch holders can attach to. In their 9mm gun cleaning kit, they offer 3 different lengths. Allowing this kit to work for both 9mm and .45cal pistol owners. Thanks to their flex cable design they have been able to include almost a dozen attachments for removing debris. 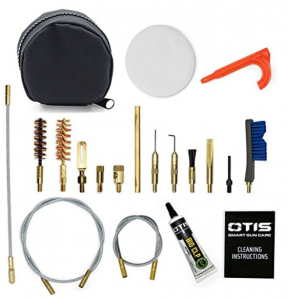 From brushes to picks and scrapers, Otis’ kit is a comprehensive kit for the shooters who have pistols that need a deep clean. We really enjoyed using this kit as it included so many attachments for getting to the hard to reach spots on our 9mm. Lastly, their carrying case is only about the size of a softball. We were really impressed with the quality and variety of tools Otis’ kit includes. Plus the no-nonsense warranty makes this one of the best 9mm cleaning kits. However, if you prefer the old solid state cleaning rod this may not be your kit. Ruger is one of the most recognizable American firearm manufactures based in Southport, Connecticut. Founded in 1949, Ruger’s product lines have had years of development and growth. They currently manufacture close to two million firearms each year. Therefore, it’s no surprise that they not only carry firearms but cleaning kits as well. 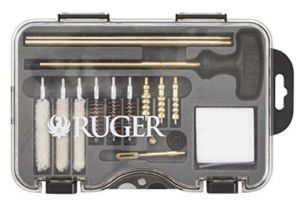 Having been the top-seller in handguns in the late 2000’s, many consumers have wanted a Ruger specific cleaning kit. So Ruger designed their very own branded kit to clean Ruger guns. However, they created this kit so that it could be used with multiple calibers including .357mag, .380ACP, .38cal, 9mm, 10mm, .44mag, and .45cal. This is a solid classic kit. What we mean by that is they don’t have any new inventions or developments here. What they do have is a kit that gets the job done. The kit has the essential tools needed to make any 9mm look like new. This is one of the simplest 9mm cleaning kits we were able to use. However, it lacks the comprehensiveness as the other kits on our Best 9mm Cleaning Kits list. You still have to buy solvents and cleaners. Which if this isn’t your first gun kit you more than likely will have some of the best CLP and oils. If you don’t check out our top solvents here. The Kleenbore kit is one of the simplest on the list, however, one of the best 9mm cleaning kits. They offer Break Free CLP inside their kit, which is one of my favorite CLP’s. A lot of the top 9mm cleaning kits offer an extensive amount of tools and attachments but they fail to offer a CLP. Being able to open your 9mm cleaning kit and have everything in front of you is a huge benefit when cleaning. It’s easily not the flashiest or best on the list, but the Kleenbore gun kit will get the job done. The rod itself is solid one-piece design which includes the handle making it quite easy to scrub your barrel out. I wish they would include more options inside the kit, because when you purchase you need to specify if you want a 9mm, 10mm or .44cal cleaning kit. Many of the other kits on our list offer at least one other gun calibers cleaning tools in the kit. Whereas Kleenbore’s gun cleaning kit only offers one caliber size. Not our top pick as it doesn’t offer the versatility and quality we would prefer for our 9mm cleaning kit. Nonetheless, this is a great simple cleaning kit that offers a spot for your solvents within the kit. 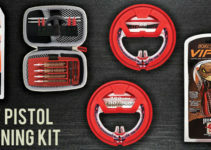 Since you are already familiar with the Real Avid Handgun gun cleaning kit. We don’t need to get into too much detail about Real Avid other than they create some high-quality products. Even though we really like the Gun Boss the Real Avid Pro has to be included on the list because it not only has numerous caliber cleaning tools but it has an even better cleaning rod than the other kit. The rod is made of brass and not only do you get one but two are included in the kit. Making it a little easier when cleaning and swabbing with the Real Avid kit. It also includes a much nicer handle that is fitted with a non-slip rubber coating. The kit isn’t as small as their other one, but they still offer a polycarbonate case that’s shatter-resistant and waterproof. This kit really comes with a lot of tools and cleaning supplies considering the low cost of the kit. However, I can’t take any credit away from the other Real Avid Handgun kit as this kit is a little larger in size. The Pro is one of the best 9mm cleaning kits. Offering such top quality products with one of the most comprehensive tools and cleaning supplies included. 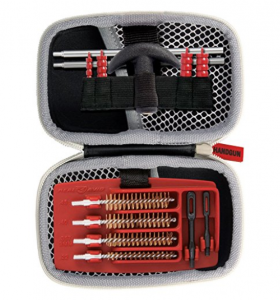 If you are in need of a 9mm gun cleaning kit grab this one you won’t be disappointed. Read any firearm manual and they recommend cleaning your gun after each use. Now realistically that seems like quite a chore. However, by purchasing one of these high-quality 9mm gun cleaning kits, that chore will become more of a hobby and obsession. When I bought my first firearm I can remember not even knowing how to clean it or even when to clean it. Thankfully my grandfather ended up telling me how important it was to clean each firearm after I use it. Not only do you learn every detail of your gun but you learn to properly take care of an investment. Today guns can range well into the thousand dollar range. If you simply just put your firearm away after firing rounds through it, you could risk damaging your gun. Gunpowder is actually corrosive and contains salts that can begin to break down the metal on your gun increases the chances of rust. Also as most rounds are made of a copper jacket and lead core, as the round exits through the barrel the metal can begin to adhere to it. After long-term use without cleaning this can lead to poor accuracy and corrosion. Also after cleaning knowing how to properly oil and lubricate your gun is extremely important. Especially if you don’t use your gun often and it’s stored in a safe for some time. Each gun manual will have directions on where to lubricate or there are a ton of youtube videos showing how to oil just about every gun. Once you have selected a cleaning kit and learned why you need to clean your gun. One needs to know what products to clean their gun with. There are multiple degreasers and solvents to break up gunpowder and metals that get stuck inside your gun. To learn about the top solvents and oils to use on your gun, check out our article here. First and most importantly is find a space in your house such as a desk or workbench to make your cleaning space. If you don’t have a cleaning mat pick one up they aren’t too expensive and they tend to keep your parts organized and prevent you from losing any when disassembling your gun for cleaning. Not sure what mat to buy? Check out Guns Cleaner’s top picks here. Next review your gun manufactures owner manual to understand how your gun needs to be disassembled. Be sure to place your gun parts on your cleaning surface or mat in order of removal, preventing you from losing any parts. Start by spraying CLP or bore cleaner down your handgun barrel and use your selected 9mm cleaning kit’s bore brush and cleaning rod to scrub your barrel. Next, you want to use a little more bore cleaner and run a swab or patch through the barrel about 4-6 times or until your patch is still clean when you pull it out. Next, you want to clean any of the trigger frame metal that collects gunpowder and dust. Using a soft brush and solvent is recommended to get into the tiny tough to reach areas. If you take a cotton patch and swab and clean the areas of the trigger frame, you should be able to know when its clean as a pure white patch will remain. Once you have properly cleaned your gun barrel, slide, and trigger frame, you will need to oil and lubricate. Generally speaking, any place that is metal to metal will need some oil, or you can refer to your owners manual for the manufactures recommendations. It’s not hard to find a 9mm cleaning kit almost all manufacturers create a kit these days. However, finding the best takes some time and a little personal preference. Hopefully, with our top 5 picks you can determine what fits your 9mm gun cleaning criteria. Don’t be afraid to buy a couple kits, you may just enjoy some parts from each manufactures gun cleaning kit.